KAUST is a very unlikely place. A graduate-only science and technology institution with a very international population (faculty, staff, and students), KAUST also has stunning architecture, cutting-edge technology, and world-class research facilities. Situated on the banks of the Red Sea, KAUST is an ideal place to work: in the field in the morning, in the lab in the afternoon and evening, all surrounded with a lively community of students, postdocs, faculty, and visiting scholars. The KAUST motto is: "Through Inspiration, Discovery". So, it's my last day at KAUST, and I've certainly been inspired. The labs and facilities are well-equipped, the architecture is stunning. The Red Sea... well.... it speaks for itself. Given all of this inspiration, what have we discovered? As you can probably tell from my guest bloggers (here, here and here) this trip, there are TONS of interesting questions to be asked, and much to discover. This is my second trip here, and on my first, Michael Berumen and I documented two new records of corallivory. That's right, a bunch of tubes. But don't be disheartened - the contents of these tubes contain answers and discoveries. It will take a few months of chemistry, math, and statistics to finally answer our questions, but that is actually pretty fast. We'll be looking at macromolecular nutritional content - proteins and amino acids, lipids, and carbohydrates. The pursuit of science starts in the field (at least for me), but rarely ends there. All of the post-processing work is critical, so when I get back home to Boston, I'll have quite a lot of samples to work through and keep me busy. :-) But it's not time for me to go home quite yet. Though it's my last day in Saudi, I'm off to Indonesia tonight for a joint expedition with Conservation International, National Geographic, and the New England Aquarium to explore coral seamounts, and to ask new questions. But to help with my transition, I'll keep the KAUST motto in-mind, and leave you with a photo of the Arabian setting sun. Though you might think of Saudi Arabia as remote and isolated, KAUST has literally created a scientific oasis in the desert. We have all traveled here from various places (Australia, New Zealand, the UK, Hawaii, and Boston.... to name a few....), but our dispersal across the globe has been for good reason: to come explore the Red Sea and do some new and exciting science. Though I might be geographically isolated at the moment, I have been in good company. In fact, I have been surrounded by a team of stars: Dr. Michael Berumen (my collaborator and host), as well as Dr. Howard Choat (JCU), our previous blog posters, a team of KAUST masters and PhD students, and now Michelle Gaither and Dr. Joseph DiBattista, from the University of Hawaii. 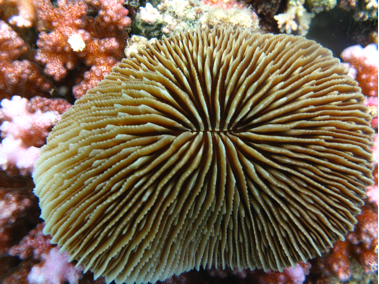 In the last post, Kathryn talked about how fungid corals move surprisingly far. Lizzie talked about how she's going to find out how far fish move within the course of their lifetime. And now, Joey and Michelle are asking about fish movement over evolutionary time - how closely related are different populations of fishes, how does geography influence their populations, and how do unique species form? While we humans are remarkably mobile thanks to air travel, fish movement is a bit more of a mystery. Trying to re-trace history is a tricky task-- especially here in the Red Sea. Dr. Joseph DiBattista is a postdoc in the Bowen Lab at the University of Hawaii, who is here with HIMB graduate student Michelle Gaither. 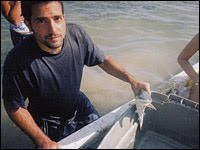 Joey did his bachelors, masters, and PhD degrees at McGill University in Canada before moving to more tropical climes. I'll let him tell you his impressions of the Red Sea, firsthand. Sniff, sniff ... I love the smell of rotting guts in the morning. The sights and sounds are infectious as the Jeddah fish market gets into full swing. Vendors shouting, the floor slick with a layer of piscivorous slime, colors abound. Today's visit is a nice break after three days of diving outside of Thuwal in the Red Sea, although that is not to say our time spent on the boat hasn't been fantastic. Our primary goal is to collect small bits of tissue from fish species and invertebrates, for a genetics study, that we might not normally see during regular collections on SCUBA. Deepwater snappers, big groupers, and lobsters come to mind. And it seems that we are in luck, these appear to be abundant at most market stalls, each fisherman pushing his product with a wry grin. The inability to take pictures due to local customs will make identification of the more obscure fauna a bit difficult, but otherwise this place is a gold mine. We've actually come down to the Red Sea as part of a large phylogeographic project in hopes of expansion. Indeed, over the past 5 years we have collected samples from reef fish and some invertebrate species at a number of sites in the Indo-Pacific; genetic methods have allowed us to assess the level of connectivity (and dispersal) between islands, archipelagos, and coastlines. Given that our home base is the Hawaii Institute of Marine Biology (not bad at all!! ), the survey was initially focused on addressing some interesting historical questions quite close to home. For example, Hawaii is known for the highest level of endemic (indigenous and exclusive) reef fish fauna in the world, and yet we still don't know where they came from or when they got there. The two competing hypotheses are that reef fish colonized from the west Pacific via an offshoot of the warm water Kuroshio current somewhere near the coast of Japan, or they otherwise made their way up the southern line island chain, perhaps using Johnston Atoll as a stepping stone for colonization into Hawaii. These ideas are based on the overlap of fish fauna between these regions, as well as some models that simulated larval trajectories between such sites. Sequencing DNA at mitochondrial genes (i.e., Cyt b, COI) have allowed us to address theses competing hypotheses by assigning approximate dates to population splitting or colonization events, although the verdict is still out. 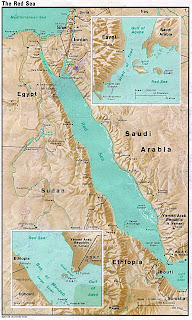 The push to get into the Red Sea was spurred by the fact that this body of water is similarly renowned for a high degree of endemic fish fauna (~17% overall). That is, ~17% of the reef fish in the Red Sea are found only in the Red Sea. In fact, endemism is as high as 50% for some charsimatic taxa like the butterflyfishes. What can explain such isolation? 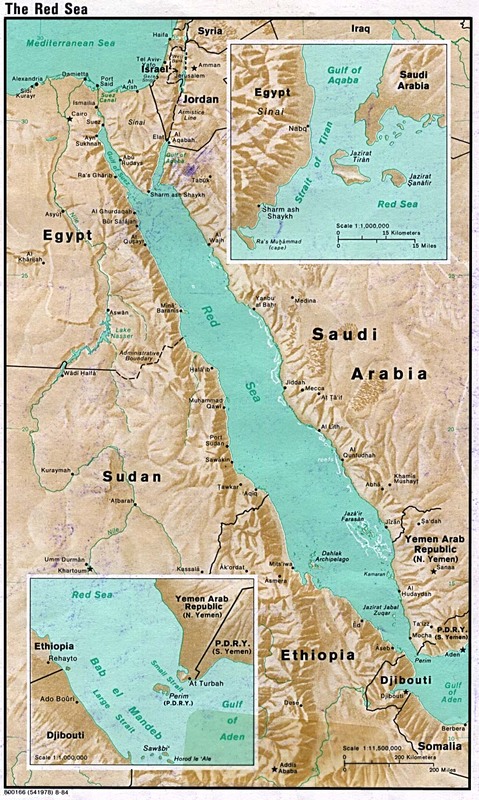 Well, several barriers to dispersal from the Red Sea region have been proposed. 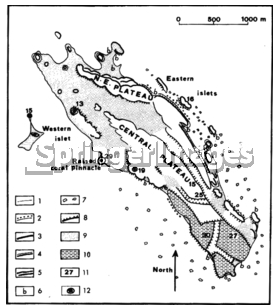 First, the narrow (18 km wide) and shallow (100 meters deep) nature of its only connection with the Indian Ocean, the Straight of Bab-el-Mandab, presumably restricts movement of planktonic larvae in and out. This is particularly true during low sea-level stands as recently as 10,000 years ago that decreased the exchange of water masses through this narrow straight and may have led to massive extinction of fish fauna. Another potential barrier exists just outside of the Red Sea in the Gulf of Aden and Indian Ocean. 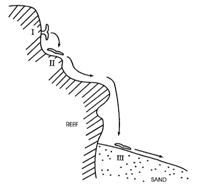 Indeed, a lack of suitable reef habitat from Somalia to India or Kenya, due in part to the cold water upwelling found off most of this coastline, may greatly restrict the dispersal of reef fish larvae and thus act to reinforce endemic species. Genetic tools provide a means to test these ideas. So, it's now back to the lab to process all of these samples! Balancing the taxonomic books is not simple... but here in the Red Sea, hopefully we'll come out in the black. It is a great pleasure to introduce the first of a series of excellent guest bloggers who I have been working and diving with here at KAUST, in Saudi Arabia. While I am here examining the nutritional basis of corallivory, Lizzie is busily gearing up for an ambitious and important project that will examine the movement of adult reef fishes. 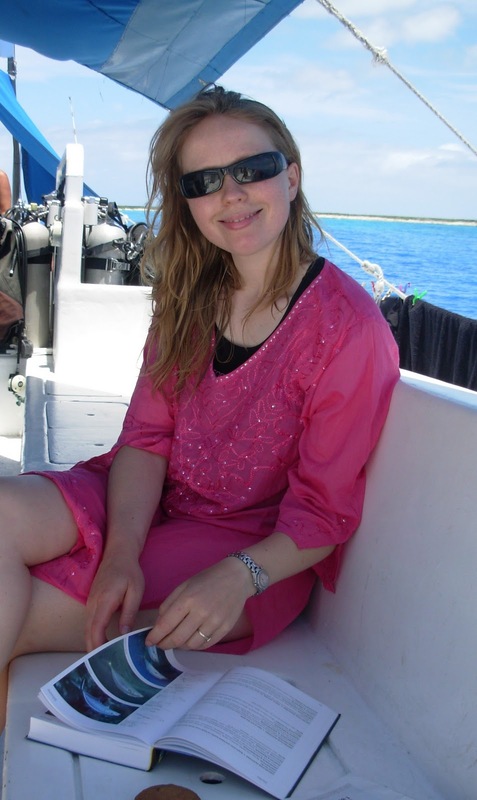 Dr. Lizzie Tyler is a postdoctoral researcher at King Abdullah University of Science and Technology (KAUST) in Saudi Arabia. 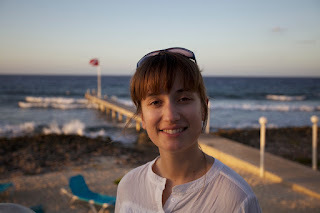 She is studying the movement of coral reef fish in the Red Sea. She gained her doctoral degree from Oxford University in the UK, where she worked on marine reserves in Zanzibar, East Africa. Marine reserves, areas in the sea which are closed to fishing or other human activities, are becoming an increasingly popular method for conserving the ocean and managing fish stocks. 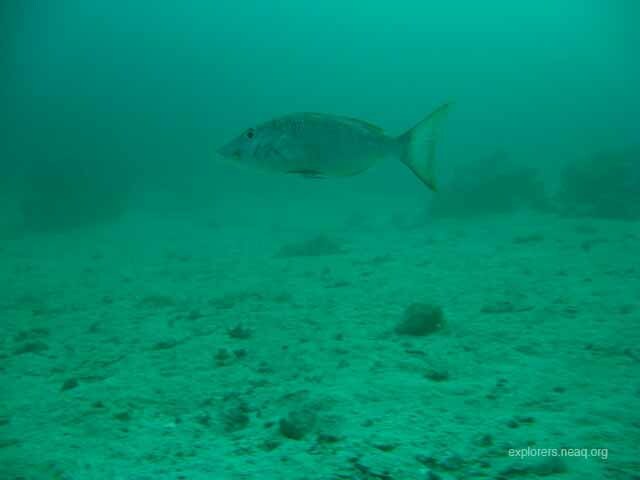 However, to understand how effective they are at protecting different fish, we need to know how far these fish move--or rather swim! A 70 cm long Nagil we caught and successfully released. 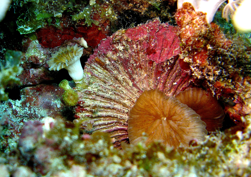 In Dr. Michael Berumen’s Coral Reef Ecology lab here at KAUST, we are generally interested in how connected coral reefs are, that is, the extent to which any two reefs share juvenile or adult corals and fish. If we protect a reef from fishing, we want to know what proportion of time our fish will spend on the protected reef, and whether they are likely to move to other reefs that are still being fished. This movement may be good: providing a supply of fish that have increased inside the protected reef to fishermen on other reefs. 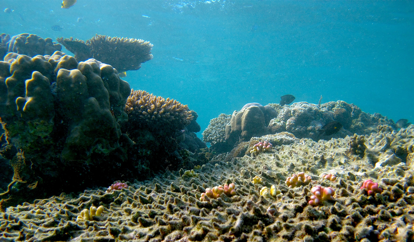 This movement may also help to maintain important processes on reefs where fish populations are low. For example, parrotfish are avid grazers, eating algae and dead coral and providing clean rock surfaces for juvenile corals to establish and grow. Parrotfish in the fish market in Jeddah, Saudi Arabia. 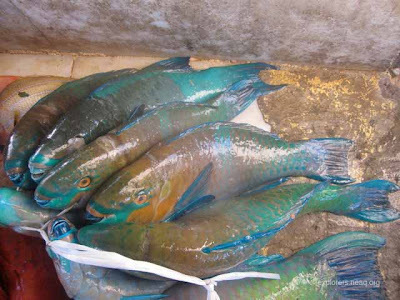 Parrotfish are commonly caught, but are important grazers on coral reefs and if they move between reefs, they can graze on reefs that have been heavily fished, keeping them healthy. 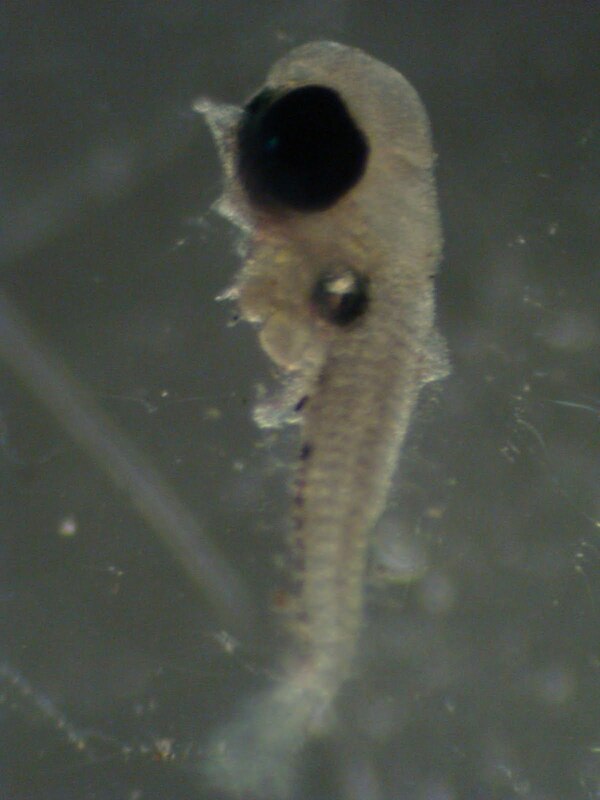 My project focuses on measuring adult reef fish movement. We will be implanting small tags inside the stomach cavity of different fish species. These tags transmit a loud noise, at a very high frequency (above the hearing range of all marine animals). 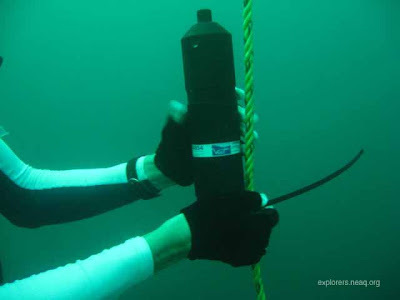 To listen for these tags, we will place several receivers underwater on different reefs, which will remain stationary. Each tag inside a fish transmits a unique code, which is identified by the receiver. 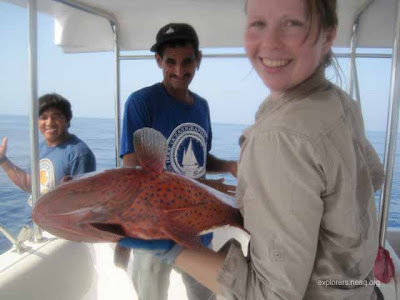 By looking at which receivers have heard which tags, we can map where fish have traveled. An acoustic receiver being attached to a mooring line. The receiver will be left there to listen for tags and later removed to download the stored data. The challenging part of this project is that it requires us to be both fishermen and vets, since we need to capture fish successfully, without harming them, and then perform surgery under anaesthetic to insert the tag before they are released. Inserting an acoustic tag in the stomach cavity of an emperor fish during surgery. The fish are kept alive with water pumped over their gills containing anaesthetic. We hope that the results of our project will be used to help design marine reserves both in Saudi Arabia and on other coral reefs around the world. Wish us luck with the fishing! After a brief trip to freezing-cold Boston (brrrr), I'm now in Saudi Arabia, once again examining fish-coral interactions and continuing the work we started last year. I am once again grateful to be hosted by my colleague Dr. Michael Berumen, an Assistant Professor of Marine Science at KAUST, the King Abdullah University of Science and Technology. On my way here, I flew over Egypt, of course all-the-while wishing my friends and colleagues in Egypt a smooth and safe transition in this tumultuous time, following the recent chain of events. You'd never know from the air that anything had changed, though. I flew over Luxor (the ancient city of Thebes) at sunset, and then over the Nile, and then Valley of the Kings. Looking down at the desert with the setting sun was stunning (sorry no photos - couldn't get my camera fast enough), and I was struck at the beauty of desert mountain chains. Now, 2 days, 5 dives, and less than 10 hours of sleep later, I am once again struck by the beauty of chains - but not mountains this time. Today's dives were full of research-related activity, but we all spent a moment or two admiring the chains of salps that were visiting the reef. Salps are pretty interesting creatures. They look like jellyfish, but guess again! They are actually more closely related to vertebrates (they are in the Phylum: Chordata). They are relatively rare on reefs; the only other time I've seen them is blue water diving with Dr. Larry Madin (Woods Hole Oceanographic Institution) in the Phoenix Islands. The reason salps are so rare is because they are typically open ocean, pelagic animals. They slowly swim through open water, all-the-while filtering the water for food. 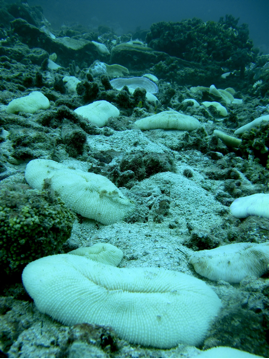 Every once in a while, they get swept onto the reef from offshore. We were diving on very dramatic reefs with slopes that literally rise from the depths without much by way of ledges or shelves--just a steep wall of coral, and then an open vista of blue. Salps don't always form chains; they can also live as solitary individuals. But an individual can reproduce asexually by making clones, which form a chain. The chains start out small, both in size and number, but 10's-100's of clones can form, all tiny at first. The chains can stay together for a long time, swimming and feeding on plankton together until they eventually break apart from each other. They are important organisms that filter phytoplankton in open oceans. They are difficult to study, but Dr. Larry Madin is an expert (see his posts from the Phoenix Islands Expedition here). For me, salps are an important reminder that reefs are connected to the sea around them. 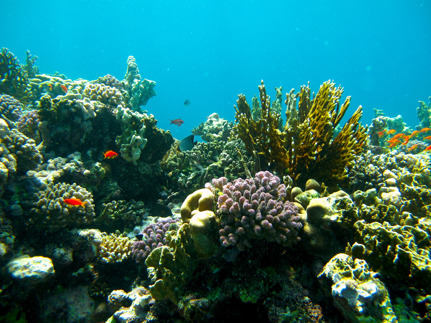 It's tempting to think of a coral reef as an oasis in the middle of an open-ocean desert (especially in Saudi Arabia! ), but the open ocean is full of life which interacts with reefs. For example, when salps get swept onto a reef, they also become food for many fishes. We observed tons of feeding behavior as tons of reef fish ventured out of their comfort zones to nibble on a small salp-snack. 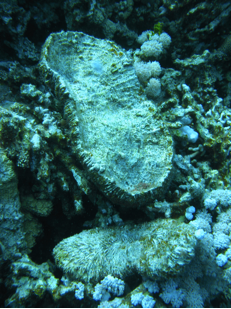 Nutrients in the open ocean also arrive on reefs from offshore and from deeper currents. Pelagic filter-feeders like salps also help to keep waters clean and clear (which is critically important for tropical reefs). Typically, when I'm on a reef wall, my attention is wholly focused on the corals and my back is to the blue. But today, I had a great reason to turn around and admire the salps and remember the critically important role of the organisms in the surrounding sea.